Polyclonal antibody raised in rabbit against 5-hydroxymethylcytosine conjugated to KLH. hMeDIP (hydroxymethylated DNA IP) was performed using the Diagenode antibody against 5-hydroxymethylcytosine (Cat. No. pAb-HMC-050). DNA from mouse ES cells was prepared with the GenDNA module of the hMeDIP kit and sonicated with our Bioruptor® (UCD-200/300 series) to obtain DNA fragments of 300-500 bp. One μg of sheared DNA was spiked with the unmethylated (C) methylated (mC), and hydroxymethylated (hmC) controls from the Diagenode “5-hmC, 5-mC & cytosine DNA Standard Pack for hMeDIP” (Cat No. AF-107-0040). hMeDIP was performed with 3.5 μg of the rabbit 5-hmC antibody and the IP’d DNA was analysed by qPCR using primers specific for the 3 different control sequences. Figure 1 shows that the Diagenode rabbit polyclonal antibody against 5-hmC is highly specific for the 5-hmC base modification (no IP with non-methylated or methylated C control fragments). 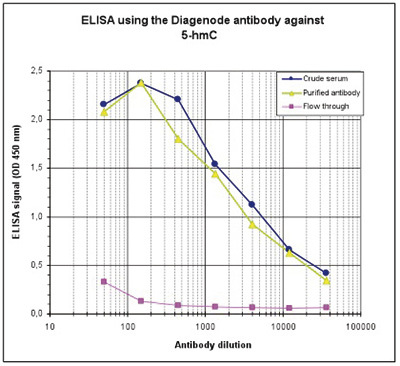 To determine the titer, an ELISA was performed using a serial dilution of the Diagenode antibody directed against 5-hmC (cat. No. pAb-HMC-050), crude serum and flow through, in antigen coated wells. The antigen used was the 5-hmC base coupled to BSA. By plotting the absorbance against the antibody dilution, the titer of the antibody was estimated to be 1:2,800. 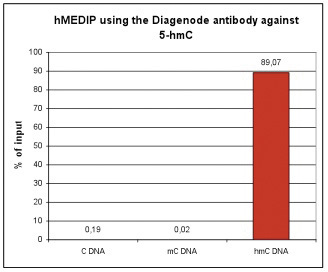 To demonstrate the specificity of the Diagenode antibody against 5-hmC (cat. No. pAb-HMC-050), a Dot blot analysis was performed using the hmC, mC and C controls from the Diagenode “5-hmC, 5-mC & cytosine DNA Standard Pack” (Cat No. AF-101-0002). One hundred to 4 ng (equivalent of 5 to 0.2 pmol of C-bases) of the controls were spotted on a membrane (Amersham Hybond-N+). The antibody was used at a dilution of 1:1,000. Figure 3 shows a high specificity of the antibody for the hydroxymethylated control. Diagenode strongly recommends using this:	5-hydroxymethylcytosine (5-hmC) polyclonal antibody (rabbit) - Classic (Diagenode Cat# C15410205-50 Lot# A1203-0041). Click here to copy to clipboard.